I joined Twitter to find friends. Now, hear me out, because this isn’t nearly as sad as it sounds. I was a huge fan of the TV show, “Lost,” which to this day I maintain is the best show ever. (Seriously. I’m still so obsessed with it. My love will never fade. But I digress…) I had plenty of “real life” friends, but they didn’t watch “Lost.” If you’re a “Lost” fan, you know that this is a show that demands discussion. It needs to be talked about. So I went to the only place I could think of to find willing discussion partners: the Internet. I wound up on Twitter because I had heard Ashton Kutcher talking about the site in an interview. Simple as that. I found exactly what I was looking for on Twitter: tons and tons of fellow “Lost” fans. We swapped theories, reviewed episodes and slowly formed a sort of TV-inspired family. Even now I talk to some of those original Twitter friends. Though these days, sadly, we don’t discuss the long-gone “Lost” very often. The point of this little story is that Twitter is a place for connections. It’s a place to make friends and acquaintances and to build an online family. When I was younger, I used Twitter primarily as a place to discuss shows, and while it still serves that purpose for me, I’ve branched out and started to understand that Twitter is an incredibly strong professional resource as well. As an aspiring writer, I’ve found that there are so many resources available to me on Twitter, perhaps the most beneficial simply being others Twitter users. Nearly everyone has a Twitter account, including journalists and writers. For young aspiring writers or writers just looking for some new faces in their lives, there are few places better than Twitter for building connections that could be of huge benefit in the professional world. By following and creating personal connections with writers and journalists on Twitter, you become open to job opportunities, endless wisdom, potentially beneficial friendships and, just as importantly in the long run, good friends with similar interests. I’ve gotten multiple writing gigs just from knowing people on Twitter. (This article itself being one of them.) I’ve met great friends, and I’ve built so many personal connections. It doesn’t take any special skill to build these relationships and find benefits. Anyone can do it, but it’s a matter of putting yourself out there. Before even attempting to build strong connections, give your own profile a look. Looking like you matter will go a ridiculously long way online. This isn’t meant to imply that you don’t already “matter,” of course, but the more professional and important you appear, the more people are going to follow you. So spruce up that background, cover photo, biography and profile photo. If you’re looking to build professional connections, keep your own account professional. It sounds old fashioned, but remember that anything you post online really could be there forever. If you wouldn’t feel comfortable reading your tweets or showing your picture to your boss, maybe you should think twice before posting. Once your own account is cleaned up and presentable, the first step is finding the people you want to connect with. The easiest thing to do is to take advantage of Twitter’s search function. Think of all of your favorite writers and journalists and search their names. More often than not, that’s all it takes. Most people, especially professionals, do have Twitter accounts. However, if you aren’t quite sure who you’re looking for, this first step can be a little trickier. Many people don’t have specific favorite journalists or writers and there’s always a decent chance that the people you search for simply won’t have accounts on Twitter. After all, writers are typically busy writing. If you don’t know who you’re looking for, how do you find that person? The best answer is to narrow down not who you’re looking for, but what. Think about the topics that you’re interested in. Twitter’s search function doesn’t just allow users to search for other users; it also allows you to search for keywords used in tweets. Determine what you’re trying to find, search those key topics using Twitter’s search function and browse through the users who are talking about what you want to read about. What do you currently write about or want to write about? What are your professional and private interests? What kind of journalist do you want to know more about? What kind of writer do you want to know more about? What topics really peak your interest? After answering these questions, it shouldn’t be hard to determine what to look for. For example, most of these answers for me would revolve around film and television, as those are my main professional and private interests. I currently write about film and television. Film and television are my interests. I want to know more about journalists and writers who talk about my interests. These answers would prompt me to search “film and television.” To narrow those broad topics down a bit, I would search for my favorite TV shows and movies. Twitter shows “top tweets” first in search results, which makes it easier to find credible, respected users. After following multiple users who meet my interests, I would be one step closer to making legitimate connections with journalists and writers on Twitter. Next, the key is engagement. If you’ve read any of my past social media articles, you know that engagement is something I talk about a lot. That’s because it really is the best way to get anything done on social media. If you want to befriend someone personally or professionally on Twitter, you have to reply to his or her tweets and start conversations. “Big name” users on Twitter usually won’t come to you, and they shouldn’t have to. Respected journalists and writers in particular have already put the work in. They’ve made a name for themselves. Now it’s your turn, and building connections with those who have already found a healthy level of success is a good place to start. Without being spammy or annoying, reply to anything that interests you. Initiate conversation whenever you can. You might not always get a reply, but that isn’t important. If you respond to someone regularly enough, he or she will get used to seeing you, and that person will be more likely to respond. Don’t stop with simply replying to interesting tweets. Ask questions. Start conversations. If you’re like me and you’re interested in television, take the chance to ask your favorite critic what his favorite show on right now is. You’ll be putting yourself out there and gaining valuable information about what you should be watching. Once you’ve found a few trusted writers and journalists who you enjoy on Twitter, pay attention to the accounts that those people regularly interact with. Often writers and journalists almost exclusively engage with other writers and journalists on Twitter. Check out the lists of people who top users follow and the list of people who follow top users. These will typically be users that like the same things as you, and it’s helpful to connect with as many people as possible, especially on a professional level. You never know who has the connections that you might one day need. But everything on Twitter isn’t about being professional and using potential resources. Remember that you have the chance to make friends as well. For me, that’s been one of the most valuable aspects of social media. Sure, I’ve gained some great professional contacts, and I hope to one day turn those into job opportunities, but I’ve also made awesome friends who I can talk to about just about everything. After you’ve found a group of journalists and writers you respect and enjoy, keep working to build up those connections. Be patient because strong connections aren’t made overnight. And don’t stop with Twitter. If you’re trying to connect with someone — and I mean really connect — look him or her up on any social media site you can think of. Try Facebook, YouTube and especially LinkedIn. Some of these accounts might be private and reserved only for personal friends, but there’s a decent chance people will befriend you on other sites. I know I’ve added plenty of Twitter friends to my other accounts. Above all else, never stop exploring and engaging online. There are more users on Twitter than you could imagine, and there are always more interesting people to discover. Even after you’ve built a few great connections, keep striving for more. Thanks for reading. 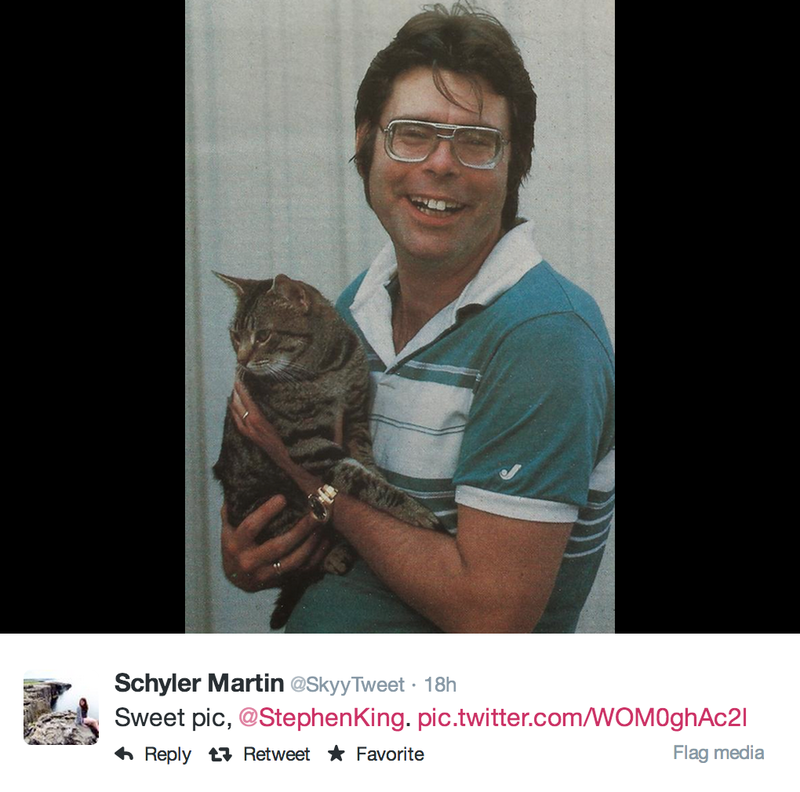 If you have any further questions regarding building connections with journalists and writers on Twitter, or if you just want to chat, feel free to reach out to me on Twitter @SkyyTweet or through email at schylermartin@gmail.com.